I can't explain how good it feels now that all of my exams are over and I have a break from Uni until March next year. Not only does it give me time to work on the blog, work in general and just make these next 3 months huge and try to achieve as much as I can, but I get to also do things like read the huge list of books I've had written down (recommendations are always welcome!) and prepare myself mentally for Taylor Swift's concert in a few weeks time (seriously). I turned 21 on Tuesday and went out with a few friends on Friday night with this as my birthday outfit - except for the shoes which I swapped for my beloved wedges as seen here, because I'm too paranoid about ruining these white beauties. I definitely don't regret investing in this blouse though and have since decided to get the white one as well (Mum already owns it in black) because its sheer simplicity adds extra class to any outfit. 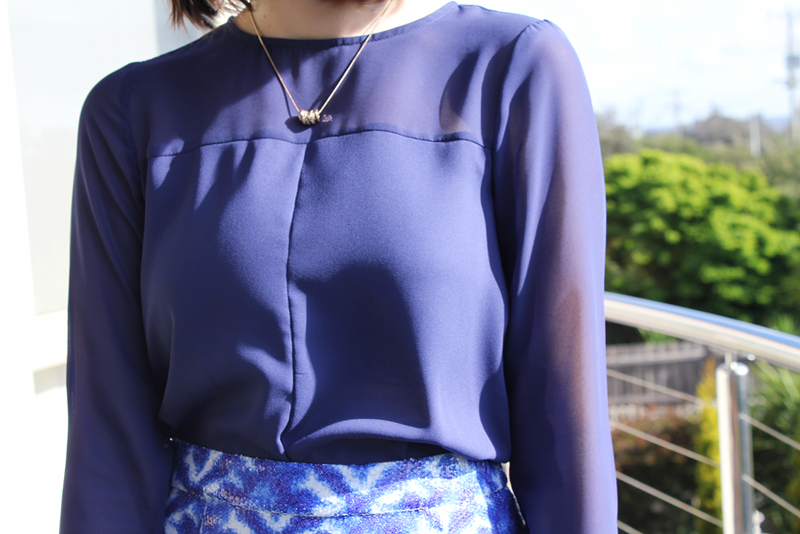 The skirt - all sequins, in case you couldn't tell - was also a gem I found on sale at DFO and has been my planned birthday skirt for at least 2 months, so I'm glad that I finally got to wear it out because the print is fantastic, don't you think? That skirt and top look perfect together! The shoes are cute, too. Totally stunning - love how chic and put together you look! Those heels are gorgeous. I like how you have combined white shoes and white nails! That's a great idea! And I do LOVE that cuff. Plus the skirt is pretty cool too! Hey there! :) I am totally loving this look. 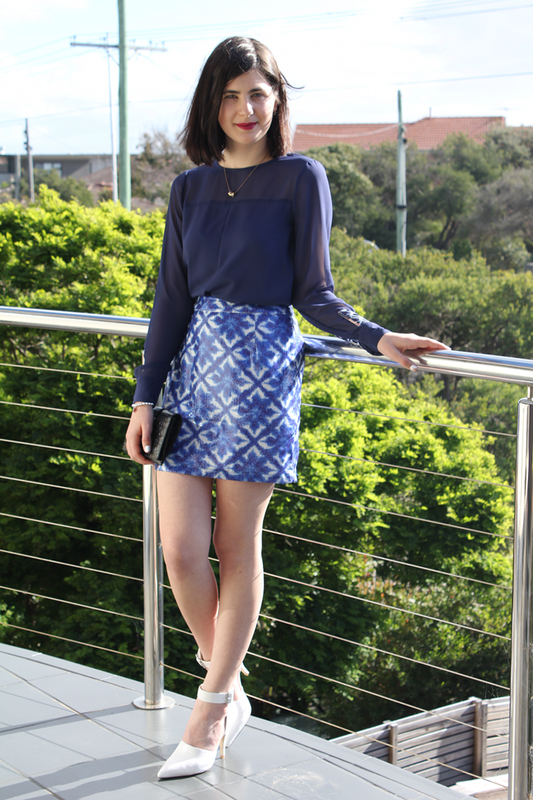 Blue looks fantastic on you and that skirt is just amazing! White on white (in any way) is definitely one of my favourite trends this season. Thanks for the love Kiri! Thanks miss! 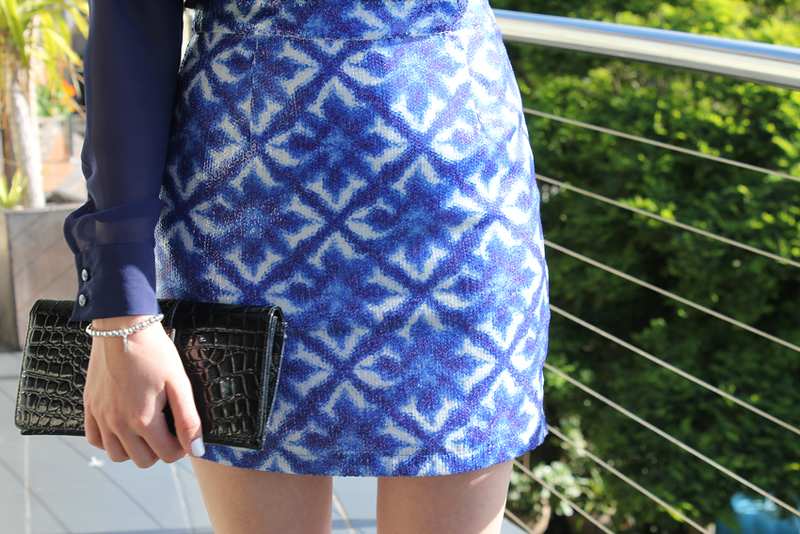 The skirt is definitely one of my favourite buys right now! Love this look - so pretty! Stunning! The hair movement is "dreamy" <3 I look forward to your future posts Ivana! Oh i so love the look!